Learning based on recorded procedures is nowadays a routine in the education of physicians. Training & Simulation including after action review is a very valuable approach to increase the skills of the trainees and to decrease errors and miscommunication in high-risk environments like operating rooms. Also in the real world the demand to record operating rooms to increase quality assurance and patient safety becomes bigger and bigger. With the Surgical Operating Room Black Box we have developed a solution to fulfill these demands. The system records all relevant signals in an operating room with the original quality. Combining this outstanding recording technology with a framework to securely handle the valuable data results in our solution for reliable operating room recording. Playback screen. Video streams can individually be resized and positioned. Each signal can be shown/not shown with a simple check box in the upper left corner. Various options (e.g. size, frameless, always on top, transparency) are available for each window. With a state-of-the-art data security framework we make sure that data protection, restricted data access and data privacy is guaranteed. The embedded juridical permissions and access system allows you to define very detailed access privileges and file handling routines (e.g. default automated recording deletion after 24 hours if the recording is not explicitly selected to be archived). The Surgical Black Box records all signals independently but synchronized in their original spatial and temporal resolution. The Surgical Black Box saves one file per signal. For example if you do a recording with four cameras in combination with two microphones and the vital monitor signal, the recording consists of seven individual video and audio files. You can open each file individually. Since the Surgical Operating Room Black Box saves each source individually, you have the highest possible flexibility concerning the playback. You can individually select which file(s) you want to watch. Just one video with audio? All videos but no audio? Just audio and the vital monitor? You decide because you have all possibilities. If you don’t want to show one of the cameras in a recording to a certain audience because is not appropriate, just deselect this camera in the available files and you are done. Fast and easy. The playback software presents each signal in a separate window, enabling you to arrange and resize the video windows as you like. Playback settings and custom views can of course be saved for a flexible and standardized reuse. You can stream all signals with individual parameters (frames per second, spatial resolution, data rate). 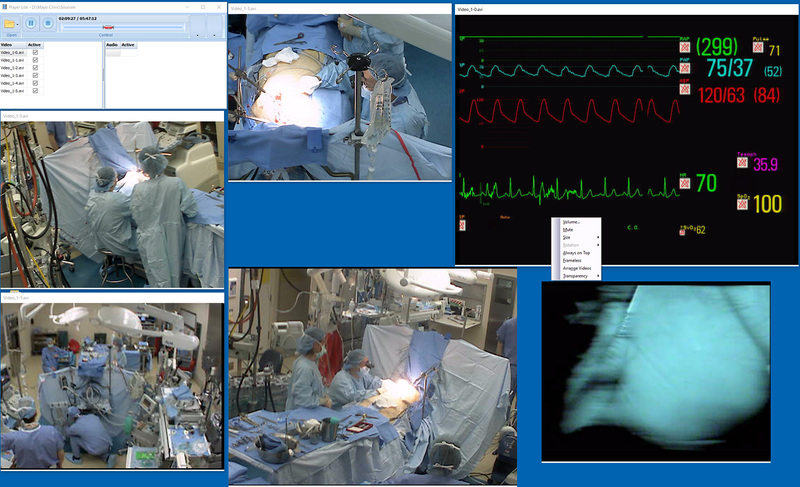 Thus our technology not only offers outstanding recording capabilities but also real time streaming for remote access to all signals of the operating room. The system allows to create bookmarks during the recording for an easier and more efficient review. You can make bookmarks manually with a simple switch or a mobile device. In addition it is possible to generate bookmarks automatically based on definable filters for recorded data streams. For example if a certain threshold is passed in the temperature data, a bookmark is generated and you can use this bookmark to jump directly to this scene in the replay. Don’t hesitate to contact us with your project requirements and we will let you know what we can provide to support you.